Sauté onion, basil, oregano and garlic with 10 oz. spinach in olive oil. Mix in 10 oz. spaghetti sauce and water. Simmer the mixture for 20 minutes. Pick up a bowl and mix mozzarella cheese, Parmesan cheese and cottage cheese to make 10 oz. Add parsley, pepper, salt and 1 egg in it. 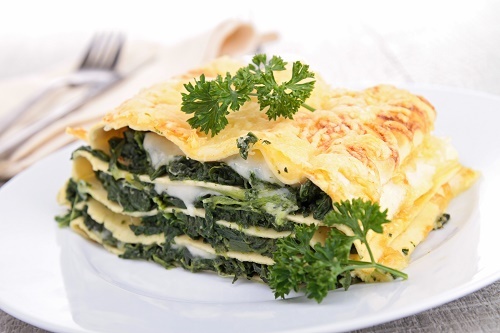 Pick up a lasagna pan and apply a small quantity of the spinach mixture to the bottom. Place three lasagna noodles on it, and layer with the cheese mix. Continue to alternate with noodles, cheese mix and spinach mix until you have five or six layers. Cover with aluminum foil and bake at 350°F for an hour. Spinach can be part of practically any kind of food. You simply need to find a recipe that’s done creatively enough to bring out the taste. Do you know any other spinach recipes?